MMHR attended the 74th Annual Dallas Independent School District/Coca Cola Basketball Tournament and the 56th Annual Whataburger Basketball Tournament in Ft. Worth, Texas December 27 and 28. Lancaster HS, ranked #7 in the state of Texas in Class 4A by the Texas Association of Basketball Coaches, played 5th ranked Dallas Kimball at Ellis Davis Field House. Lancaster came out strong in the 1st quarter and took a 16-12 lead. Kimball answered the 2nd quarter bell with a 21 point outburst to tie the game up at 33-33 at half. Lancaster’s bigs got into foul trouble in the 3rd quarter and Kimball took advantage and increased its lead by 8 points going into the 4th quarter, 50-42. This set the stage for a furious rally by Lancaster in the 4th. In the last 4:20 of the game, Lancaster outscored Kimball HS 30-9 to pull out a 77-70 win. What makes this even more special was Lancaster made this rally without a shot clock to push Kimball to speed up the game. *D’Angelo Allen(2014) 6’7″ G/F: He had 14 points. Leading scorer for his team in the game. *Derias Johnson(2015) 6’2″ G: He had 14 points. Leading scorer for his team in the game. *Jawun Evans(2015) 6’0″ PG: Evans is very savvy on the court. Also, he exudes poise. 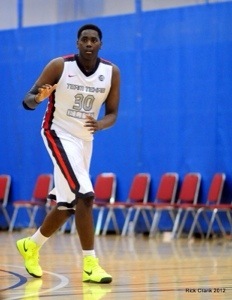 *Elijah Thomas(2015) 6’9″ P: Top 10 player in his class nationally. Eli makes excellent outlet passes in the mode of Kevin Love. He has excellent left and right hand hooks. Eli finished with a stat line of 18 points, 13 rebounds, 5 assists, 3 steals, and 2 blocks. *Kaelon Wilson(2014) 6’2″ G: Abilene Christian signee. Wilson is a steal for them. He had 15 points on various athletic drives to the basket, including back to back thunderous dunks, that were ESPN Sports Center Top 10 worthy. *Nate Morris(2016) 6’10” P: Morris is one of the better up and coming post in the Lone Star State. He has changed his body physically. Nate is built like a young Jalil Okafor. When giving the ball in the post, he makes strong post moves.